Last week, sources reported that Laura Govan's fiance, NBA player Gilbert Arenas, was close to signing a deal to play basketball overseas in China (read the story here). Well, Laura can breathe a sigh of relief through her gonzo nose because it looks like Gilbert's China deal might be on hold. According to Yahoo Sports, Gilbert was close to signing a deal with Guangdong Southern Tigers basketball team in China but there is a disagreement between the team and Gilbert on the payment schedule. The team is also questioning Gilbert's fitness level and they are actively looking for another player to replace Gilbert's spot on the team. Damn homie, in '05 you was the man homie, wtf happened to you?! 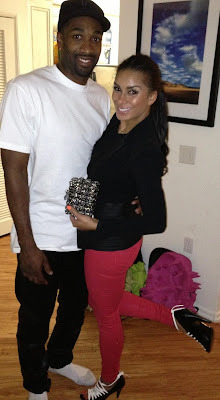 Now with Laura possibly being fired from Basketball Wives L.A. (read story here) and Gilbert without a team to play for, I wonder how this will effect their perfect relationship? *sarcasm*. What do you think about Gilbert being unemployed? Will Laura and Gilbert's lack of employment put a halt to their upcoming (I guess) wedding? They will break up soon and Laura will be back to calling and emailing Shaq. LOL They are never getting married! Been dating for twelve years, four kids and no walk down the aisle? Garbage.